World's first laptop. Loaded with 32K RAM. 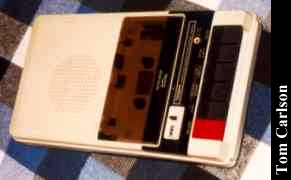 Built-in word processor and telecommunication software. 300 baud modem built-in. Great keyboard. Runs over 20 hours on 4 AA batteries. I still use it on trips. I get a kick watching businessmen use $3000 laptops to do simple text entry! And I'm not the only one. Check out Andrew Diller's cool Model 100 Pages. Featured in the February 1995 issue of Wired! I have a few anecdotal stories about my particular portable wonder. When I first got my hands on it, the keyboard's circuit board was broken (and you're right...take this from a writer, the keyboard on the T102 is better than anything out there today) so I fixed it in the true archaic style. I busted out that old soldering iron, found some telephone wire and went to work jumping the breaks in the circuit board. plugged it in and voila! good as new! And about those businessmen pounding away on laptops that cost upwards of a zillion dollars for simple text entry, I ran into some salespeople at my university's annual computer fair who were hawking the latest version of OS/2 Warp on their swank butterfly notebooks. Anyway, I showed them my T102, telling them that I had fixed it myself and was offered a job on the spot! I've recently been thinking about ditching my old 486 desktop and T102 and dropping a ton of money into one of those nice, new, black notebooks. Then, I remembered reading somewhere in my manual for the T102 that I could connect the laptop to a desktop via direct cable...and haven't looked at another notebook since. I went down to Fry's Electronics, plunked down my ten bucks for a null modem and serial cable, and it has worked better than anything outside of a true network or an Apple. Of course, the PowerBooks are nice, but they lack the character of the T102. And a network connection...for a student? Yeah, right. This thing just never ceases to amaze me...and it impressed my roommates as well. 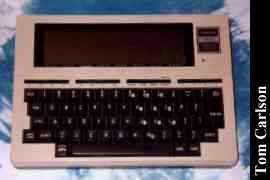 Click here to view all comments for the Tandy Model 100 and to leave your own.